My friend Brad has always suffered from excruciatingly painful, itchy skin. Often found on his face and the back of the head, Brad’s itching is the result of dry, scaly, inflamed, and red skin. Itching can be the result of a number of reasons. For instance, people may itch from insect bites, such as mosquitos, ticks, fleas, and bed bugs. Others will itch from toxic exposure to the skin from soaps, chemicals, and wool, and contact dermatitis from poison ivy, poison oak, or grass oils. There are also other potential causes of itching, including liver disease, sunburns, parasites, acne, eczema, seborrheic dermatitis, fungal infections, hives, kidney disease, pityriasis rosea, psoriasis, impetigo, allergic reactions, hepatitis, iron deficiency anemia, and rare forms of skin cancer, like T cell lymphomas and mycosis fungoides. Many medications can also cause you to itch, such as blood thinners, antibiotics, non-steroidal anti-inflammatory drugs, and other painkillers. In Brad’s case, he has eczema. In the medical community, it is also known as atopic dermatitis. The troublesome skin condition will affect between 10% and 20% of the entire population at some point during their lifetimes. Besides intense itching, other symptoms associated with eczema include skin that blisters, oozes, burns, and crusts over. Scratching and rubbing will cause further skin inflammation and irritation that will lead to hardened and darkened areas of thickened skin often seen at the back of the knees and in front of the elbows and wrists. Many people with eczema have a family history of the condition, or have previously experienced it during childhood or adolescence. Eczema is considered an allergic condition since 80% of eczema patients have elevated levels of an allergic antibody called immunoglobulin E (IgE). Children with eczema will often suffer from inflamed patches on their face, skin, including rashes that appear inside the elbows, behind the knees, and on the head. In some cases, eczema will disappear during the progression of childhood. After that, eczema may stay away for good; however, the condition may recur during adolescence and adulthood. The exact cause of eczema is not clearly understood; however, an impaired immune system is considered one of the key triggers. Allergies are implemented in eczema due to higher activation of a specific white blood cell called type 2 T helper cells. People with eczema are more susceptible to staph infections, since they have difficulty killing bacteria. (Staphylococcus aureus is prevalent in 90% of eczema cases.) High amounts of candida-related antibodies also indicate a yeast infection in people with eczema. Eczema is also thought to worsen from emotional stress, dry air, and exposure to certain allergens, especially food allergies like eggs, wheat, soy, milk, tomatoes, nuts, seeds, peanuts, citrus fruits, chocolate, fish, and cereals. Contact with various skin irritants can also trigger eczema, including wool, soaps, topical medications, plants, metals, pollutants, dyes, perfumes, and even exposure to sunlight. Other possible root causes of eczema include poor digestion and detoxification, low stomach acid levels, low good bacteria levels, and nutrient deficiencies like zinc, vitamins, and essential fatty acids. Eczema may also be triggered by low humidity in the winter, or from the weather being too hot or too cold, sweating before being chilled, and prolonged water exposure, like taking long baths or showers. Luckily, there are many natural remedies that treat eczema. In particular, virgin coconut oil is considered a great option for moisturizing skin, relieving itchiness, and healing the damaged skin, as long as you aren’t intolerant or allergic to coconut. What makes virgin coconut oil so special? It contains anti-fungal, antibacterial, and antimicrobial properties that can help reduce inflammation and soothe the skin during itchy flare-ups related to eczema. Coconut oil also has many important nutrients that prevent further infection, repair and nourish the skin, and help decrease flaking and itching—these nutrients include vitamin E, vitamin K, capric acid, caprylic acid, and lauric acid. The lauric acid is a rare fat in coconut oil that converts to monolaurin, a compound that effectively fights viruses, fungus, and bacteria. In other words, lauric acid helps moisturize and protect the skin, and it is completely in the coconut oil for eczema treatment. How else can you treat eczema with coconut oil? It also contains medium chain fatty acids that help heal the skin’s protective layers and reduce inflammation of your eczema-affected skin. Coconut oil for eczema is also supported by scientific evidence. 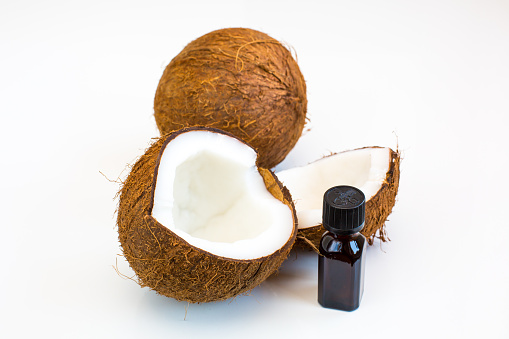 In a randomized, double-blind study published in the International Journal of Dermatology in 2014, researchers found that virgin coconut oil had a greater effect than mineral oil in 117 patients with mild to moderate eczema. Also, the monolaurin converted from the lauric acid in virgin olive oil displayed antibacterial activity in a 2008 study published in the journal Dermatitis. The researchers compared virgin coconut oil and virgin olive oil in terms of how they moisturized dry skin and removed the bacteria Staphylococcus aureus in 126 eczema patients. Only one patient who used virgin coconut oil tested positive for Staphylococcus aureus, compared to six taking virgin olive oil. The researchers concluded that coconut oil is an effective treatment for eczema, given its protective effect against bacteria, fungi, and viruses. What Type of Coconut Oil Is Best? Not all coconut oil is the same. There are two types of coconut oils—virgin and refined. The best coconut oil is considered virgin, unrefined, and organic. Virgin coconut oil is created from cold-pressing the coconut meat liquid and separating oil from the water and milk. On the other hand, refined, bleached, and deodorized coconut oil is chemically treated from the dried kernel of the coconut. This process also strips away some of the nutrients in the coconut oil. The types of refined coconut oils on the market will include hydrogenated coconut oil, liquid coconut oil, expeller-pressed coconut oil, and coconut oil. What about extra virgin coconut oil? This is mostly a marketing ploy. It is not necessary bad for you; however, there are no regulating bodies to govern whether the oil is extra virgin, like there are with the olive oil industry. How do you treat eczema with coconut oil? Coconut oil can be applied topically to the skin or ingested. Applying coconut oil on the skin: The topical method is considered the easiest. You will simply apply a small amount of coconut oil on the eczema-infected parts of your body, at least three times daily. Apply the coconut oil after showering in the morning, once or twice in the afternoon, and once before bed. This method helps the body build a healthy immune system to fight against eczema flare-ups. Taking coconut oil internally: You can also treat eczema with coconut oil by taking it as a supplement in your diet. Simply take two to four tablespoons of coconut oil for eczema every day. It also helps boost the immune system. Coconut oil can also easily be added to smoothies, salad dressings, baked goods, and other dishes that call for oil. Murray, M., et al, The Encyclopedia of Natural Medicine: Third Edition (New York: First Atria Paperback, 2012), 582-585. Balch, J., et al., Prescription for Natural Cures: A Self-Care Guide for Treating Health Problems with Natural Remedies Including Diet, Nutrition, Supplements, and Other Holistic Methods (Hoboken: John Wiley & Sons, Inc., 2004), 229-234. Rakel, D., et al., Integrative Medicine: Third Edition (Philadelphia: Elsevier Saunders, 2012), 636-641. Shiel, W.C., “Itching,” MedicineNet web site; http://www.medicinenet.com/itch/symptoms.htm, last accessed September 15, 2015. “Itching,” MedlinePlus web site; https://www.nlm.nih.gov/medlineplus/ency/article/003217.htm, last accessed September 15, 2015. Evangelista, M.T., et al., “The effect of topical virgin coconut oil on SCORAD index, transepidermal water loss, and skin capacitance in mild to moderate pediatric atopic dermatitis: a randomized, double-blind, clinical trial,” International Journal of Dermatology, 2014; 53(1): 100-108. Verallo-Rowell, V.M., et al., “Novel antibacterial and emollient effects of coconut and virgin olive oils in adult atopic dermatitis,” Dermatitus, 2008; 19(6): 308-315. “Eczema,” Healthline web site, December 12, 2013; http://www.healthline.com/health/eczema#Overview1. “What Type of Coconut Oil is Best? How to Choose a Coconut Oil,” Health Impact News web site; http://healthimpactnews.com/2014/what-type-of-coconut-oil-is-best-how-to-choose-a-coconut-oil/, last accessed September 15, 2015. “Coconut Oil for Eczema,” Home Remedies for Life web site, April 3, 2014; http://homeremediesforlife.com/coconut-oil-for-eczema/.